In this study as part of the INFLUINS project funded by the German Federal Ministry of Education and Research, temporal and spatial patterns of the mining induced subsidence in Sondershausen, Germany are analysed. By utilizing the persistent scatterer interferometry (PSI) technique with SAR scenes from different sensors a long-term monitoring of the subsidence area can be performed. Since the end of salt mining underneath the city of Sondershausen in the late 1980s the undermined area was sinking steadily with rates higher than 200mm/year until in 1996 necessary steps were taken to stop the subsidence by starting to backfill the mine with industrial debris. With the available SAR data from ERS, ASAR and PALSAR satellite sensors covering the time period between 1995 and 2010 a persistent scatterer analysis showing the results of the backfilling was done over the urban area of Sondershausen. To assess the quality of the processing results geodetic surveying data covering the same time period has been acquired. The data consists of annual measurements at 231 different locations distributed over the city area. However, only 110 of those measurements are covering the whole period from 1995, with the rest of the time series starting in later years. Each group of time series therefore has its own starting and reference point thereby disallowing a direct comparison of the different points. Additionally there are gaps in the data caused by points not being measured in certain years or others being measured on a two or three-year basis. The data shows decreasing rates over time which is common for mining-induced subsidence areas and a result of the backfilling efforts. An exponential function s(t)=h*exp((t-t_offs)/w)+h_offs was used to describe this movement for every point in the dataset. If the number of measurements for one point gets smaller than the number of parameters in the describing function the quality of the approximation cannot be computed. Therefore 17 series starting in 2007 or later had to be excluded right from the beginning. The function fit shows a high correlation with a correlation coefficient over 0.99 for 165 points and above 0.95 for over 200 points. Once calculated the exponential functions can be reduced to a simpler form using only two parameters by shifting all those points that were added later to the measurement grid vertically. The shifting amount is chosen in a way that all points have the same reference height of zero in 1995. The new function then computes as s(t)=max_subs*(exp(-t*curv)-1) with max_subs being the maximum subsidence amount, t being the time starting from the reference date in 1995 and curv being a measure of the curvature, i.e. the speed of the subsidence movement as shown in Figure 1. 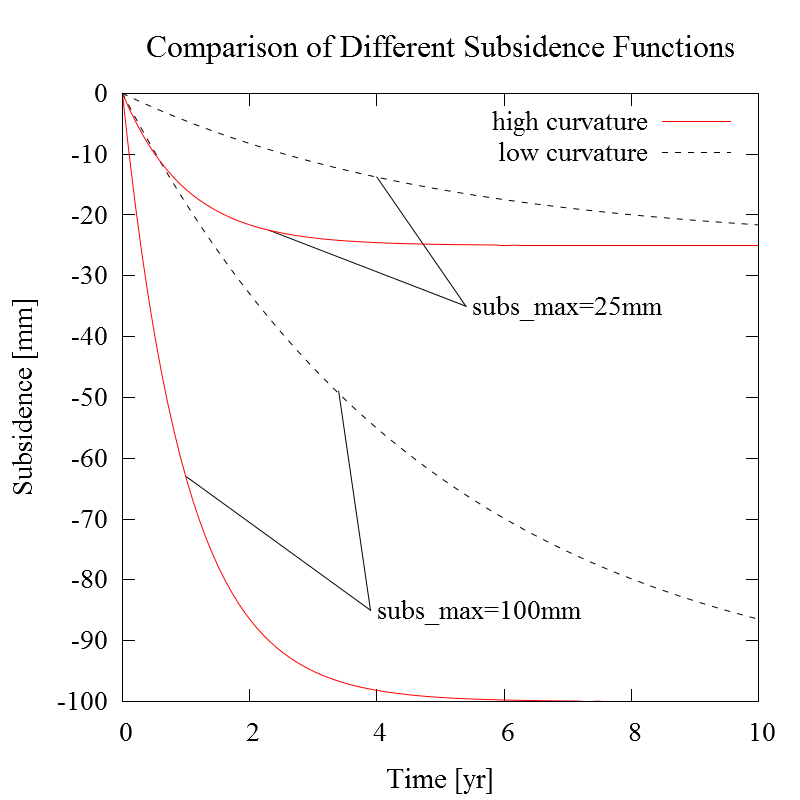 Figure 1 The subs_max Parameter is the total amount of subsidence after infinity time passed, high values for curvature yield a fast sinking point whereas low values denote a slow sinking process. For the actual comparison with the PSI results those two parameters can be interpolated over the area using a kriging method with an adequate variogram model which yields a map where for every pixel a function is available describing the movement of that specific point over the time series. This enables computation of sinking rates in between freely chosen dates on the time period as well as absolute sinking amounts for any given date in reference to a starting date. The computed values can either be compared directly to the PSI results or more advanced statistical methods can be employed.